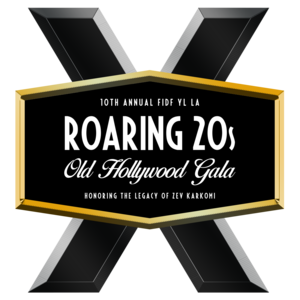 For more information about VIP Tables, Sponsorship Packages, Spotlight Branding Options, and the 10th Annual FIDF YL Roaring 20s Old Hollywood Gala, please contact Lauren Faber, ‍‍‍Director of Operations and Special Events, at L[email protected] or 323-843-2690. Gala Sponsorships Available Between $1,000-$100,000. We offer a variety of VIP tables and sponsorship opportunities, which can be tailored to suit your individual requirements and objectives. We also offer various Spotlight Branding Options, which are designed to give your company maximum exposure for its products, services and branding. Please click below for the Sponsorship Rate Book. The Gala sells out every year! Please purchase your tickets early! Ticket prices will automatically increase once 75 tickets are sold at each pre-sale price point. The Gala Sells out every year! ‍‍‍in honor of David Wiener. The FIDF YL LA Gala is 21 and over. All attendees must present a valid photo ID. Lauren Faber, Director of Operations and Special Events, at L[email protected] or 323-843-2690.